Its been a labor of love aka blood, sweat, and tears and without my husbands complete dedication to being onsite everyday, this house simply wouldn't have become our home. In early November, we bought this house built in 1922 [not updated since 1968], and began the demolition the very next day. Stripping about 60% of the house down to the studs. Our biggest projects were the kitchen, as well as the bathrooms. Next week on Tuesday I'll share more about this project. 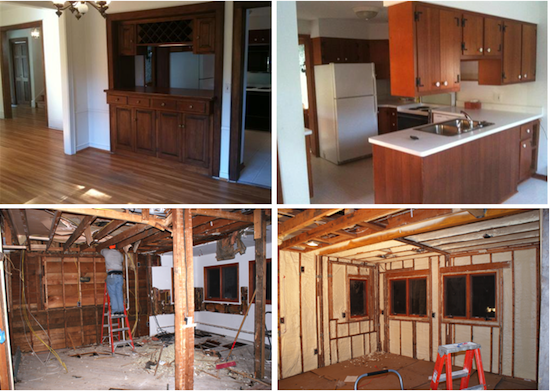 If you have any questions, or need some advice on a renovation, shoot me an email! Wow it's come a long way! Looking good! Wow it looks incredible! Cannot wait to see the finished product, I am sure its gorgeous! How incredible Keely! I love that this house was built in 1922. It must have so much character. I'm such a fan of fixer-uppers with a modern twist. I am so excited to see the final product! My stars... that kitchen is coming along fabulously! I cannot wait to see the final design! The cabinets are stunning... thanks so much for sharing! OB.SESSED with the sneak peek of your kitchen. I can't wait to see the final reveals!!! How exciting !!! Cant wait to see it all finished ! Oh my gosh - it is looking amazing! Can't wait to see the final project! What a huge project! Please share on how you made the decisions with regards to kitchen layout. I want to redo ours but I'm confused on how to keep flow and other logistical and functional decisions. That kitchen looks incredible. It's going to be a whole new house! Looks like it is coming along quite nicely dear. I can't wait to see the finished product! oh wow! I bet its going to be amazing! cant wait for next week! congrats!! I can't wait to see more pics! I'm loving the new white! Totally gorg.